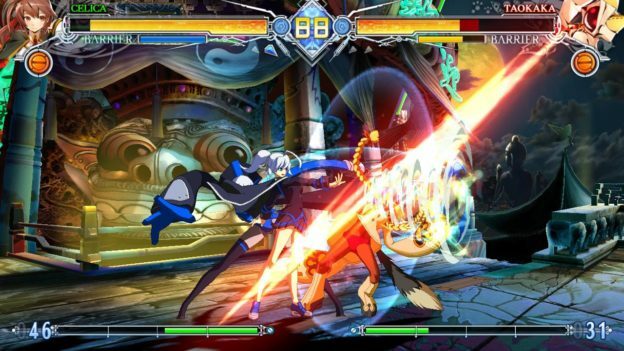 BLAZBLUE CENTRALFICTION Special Edition is part of the BLAZBLUE series, a 2D fighting game from Arc System Works. This edition is packed full of content with interesting character design, smooth controls, and upbeat music. 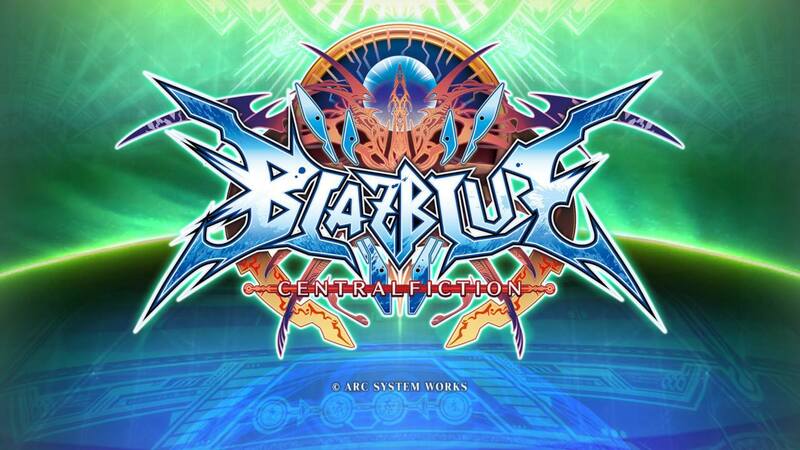 With various battle modes, practice, and a story, the gameplay seems endless. 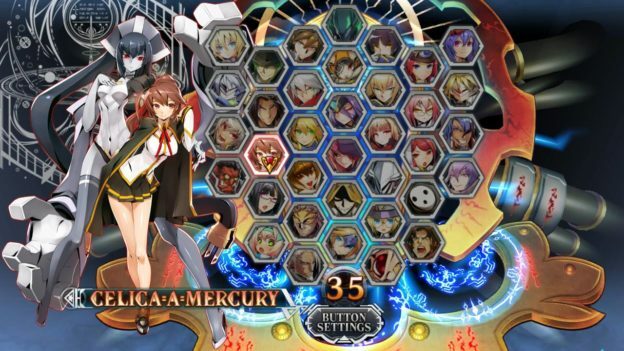 This is the first BLAZBLUE game I’ve ever played, and I understand why it’s a popular one. The beginning of the game has a theme song with top-notch animations mocking a cartoon show. The crisp graphics and responsive controls show this game was well made. The main mode seems to be the Battle Mode, which makes sense since it’s a fighting game. 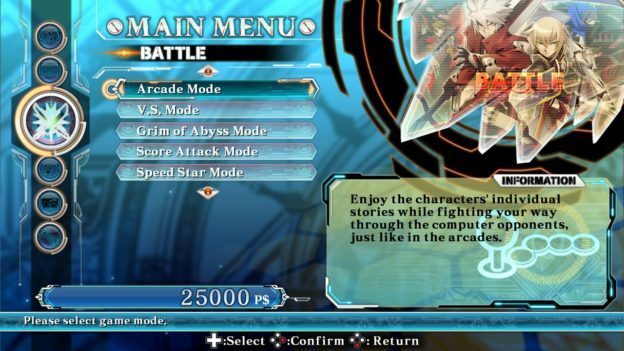 However, the Story Mode is before the Battle Mode on the main menu which lead me to believe otherwise. I played the story mode first, not realizing it was a visual novel style with very little gameplay. I wasn’t invested in the story or characters at all. I’m a fan of visual novels, though they usually have choices and some sort of gameplay. After over an hour of the story mode, I had one battle that lasted barely a minute and one decision to make. That’s when I decided the story mode wasn’t worth it. I spent the rest of my time in the game playing the Battle Mode, which has sub-modes to it such as arcade, versus, an endless mode, and more. I played the Arcade Mode the most, which had a little bit of story to it as well. The roster has a variety of characters to choose from as well as a plethora of colors and designs you can choose for your chosen character. 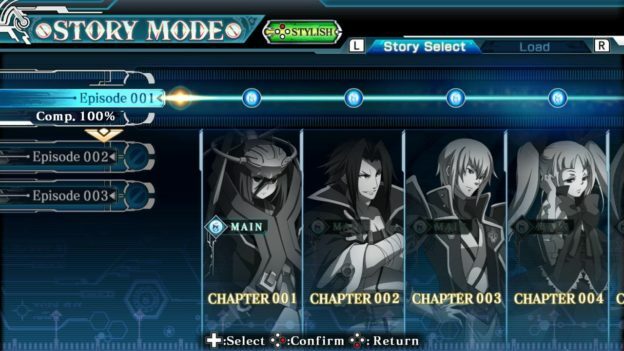 Each character has three acts to choose from with about eight battles in each act while they tell a mini story. The battles are simple with horizontal stages and HP bars for you and your opponent at the top of the screen. Each battle is timed at 99 seconds long. Each character is vastly different as well. I button-mashed the whole time, but there are various physical attacks, magic, and combos you can use for each character if you know the game well. There are no difficulty levels for the CPUs, but some battles can be super hard or ridiculously easy depending on who you play as. The first character I chose, I was barely touched in most of the battles. Yet, I had a hard time winning the first fight with the next character I chose to play as. This is a full game. The hand-drawn animations are well done mimicking an anime show beautifully. The character designs are cool and the backgrounds are simple yet eye-catching. The music is well done too. It’s hard to hear the music over the battle cries of the characters during the fights. You can adjust the volume, but at that point, I didn’t want to go back to the main menu to fix the volume. 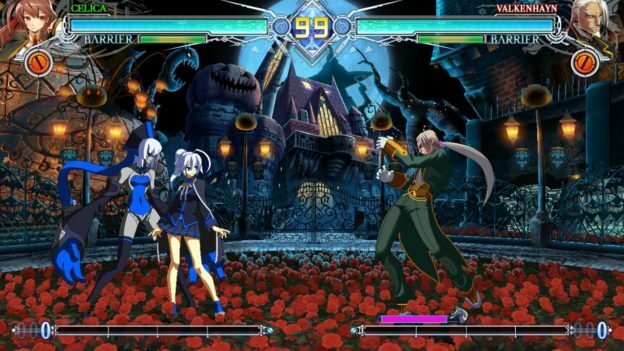 Overall, BLAZBLUE CENTRALFICTION Special Edition is a pleasing game. The battles are fun even if they can be one-sided depending on the character you choose or are up against. Still, it’s aesthetically pleasing with easy controls.